Shipboard fires? U.S. 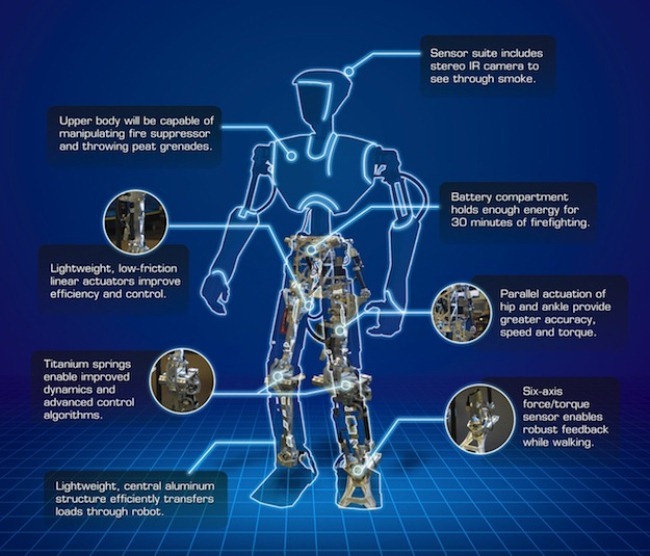 Naval Research Laboratory got that handled with humanoid firefighter robots, now on the design stage. NRL formed a team of researchers coming from their group and from various universities like Virginia Tech and University of Pennsylvania to design the robot called SAFFiR or Shipboard Autonomous Firefighting Robot. The robot can interact with humans, navigate in narrow corners, and most importantly, fight fires. The robot is equipped with various features: a sensor suite that includes gas sensor and stereo IR camera for sight through smoke; balance and agility for movement in sea conditions; and propelled extinguishing agent technology (PEAT) for firefighting. The team behind SAFFiR is also developing algorithms to rank the robot as a team member of a ship’s damage control personnel. As such, it would recognize the presence of a human team leader, understand his or her instructions and carry them out, and respond to both verbal and nonverbal communication. SAFFiR is also seen to be a potential soldier for warfighting, to aid the Naval and Marine corps.